Back on the Weight Watchers means back on the wagon means back to portion control. Since I eat breakfast when I get to work, I need a meal that is portable. 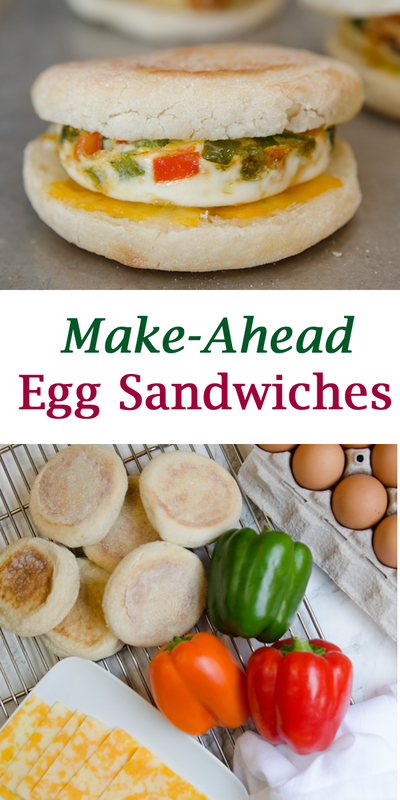 These Make-Ahead Breakfast Sandwiches are great portion-controlled breakfast. To keep the calories light I like to add vegetables instead of ham, bacon or sausage. To up the fiber, I use a whole wheat muffin. And, to add some calcium and vitamin D, I add a slice of low fat cheese. 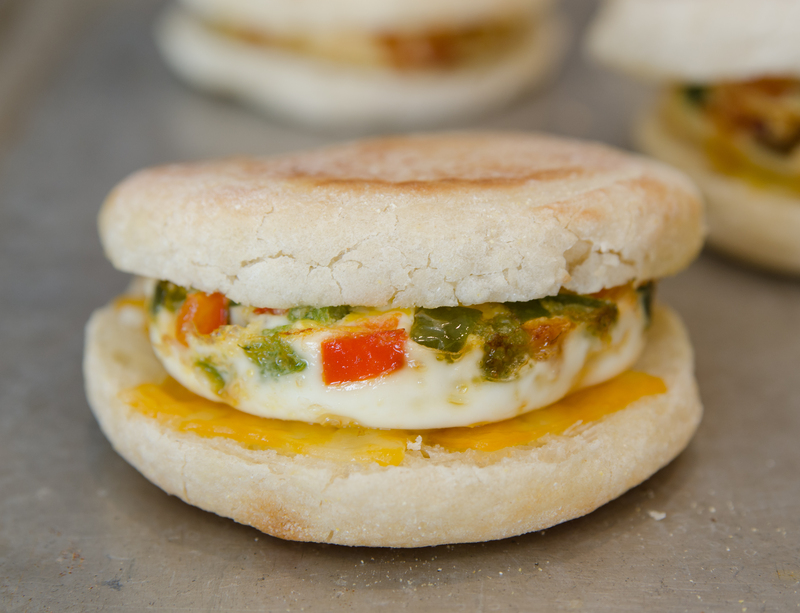 These healthy breakfast sandwiches are a LIFESAVER on busy days. In a 350 degree oven toast English muffins for 5 minutes. While muffins are hot, top with cheese. In a nonstick pan, heat cooking oil on medium heat. Add peppers and sauté for 2-3, until they start to soften. Grease 6 ramekins. Add an egg to each. Break the yolk of the egg with a fork but do not scramble. Add 1/6 (about 2 heaping tablespoons) of peppers to egg cup. Place in oven and bake for 10-12 minutes or until eggs are firm. Let cool and remove from ramekins. Place cooked egg on top of of cheese and top with muffin top. Wrap in parchment paper or cellophane. Store in a freezer bag or freezer container. To reheat, place in microwave oven for 1-2 minutes, until thawed and heated through. You can cook the eggs stove top in a non stick frying pan with a 3″ ring. For extra protein, add one of my healthy chicken sauasge patties. I like to make a batch up on Sundays, freeze and then eat all week. This post was originally posted on November 11, 2013. It was updated for accuracy in August of 2018. 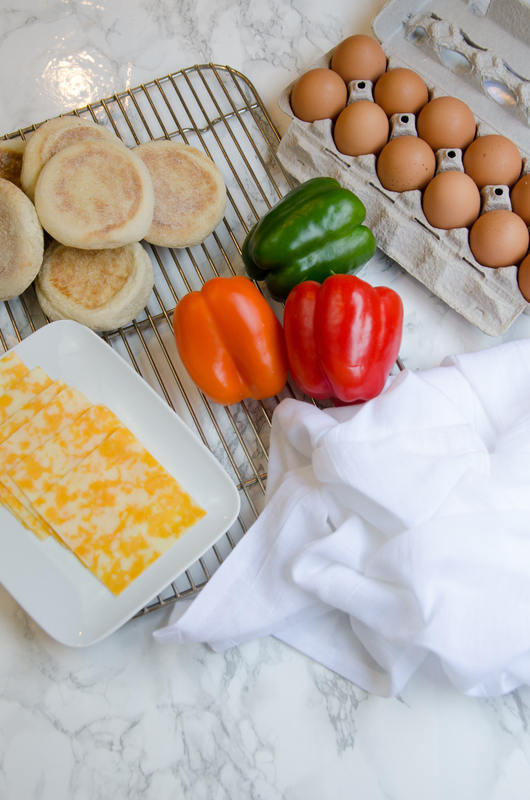 Have you thought of using the big sliced pepper (semi round) as a way of keeping the egg in place ?